A revision guide tailored to the AS and A Level Biology syllabus (9700) for first examination in 2016. 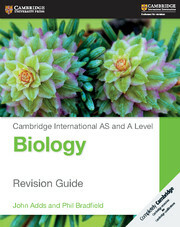 Cambridge International AS and A Level Biology Revision Guide offers support for students as they prepare for their AS and A Level Biology (9700) exams. Containing up-to-date material that matches the syllabus for examination from 2016 and packed full of guidance, such as Worked Examples, Tips and Progress Check Questions, throughout to help students to hone their revision and exam technique, as well as avoid common mistakes. Each feature of the book has been specifically designed to help students apply their knowledge in exams. Written in clear language and a straightforward tone, the Cambridge International AS and A Level Biology Revision Guide is perfect for international learners. Clear Learning Objectives at the start of each section to aid navigation and track progress. Worked Examples guide learners through content in a step by step way, illustrating how to tackle complex problems. Formative assessment in the form of Progress Check questions appear throughout, allowing learners to track their understanding. Exam-style questions in each chapter provide opportunity for summative-style assessment. Tips throughout to help and remind students about exam technique, common errors and misunderstandings.